“Joseph did as the angel of the Lord commanded him and took his wife” (cf. Mt 1 :24). Inspired by the Gospel, the Fathers of the Church from the earliest centuries stressed that just as St. Joseph took loving care of Mary and gladly dedicated himself to Jesus Christ’s upbringing, he likewise watches over and protects Christ’s Mystical Body, that is, the Church, of which the Virgin Mary is the exemplar and model. …I wish to offer for your consideration, dear brothers, and sisters, some reflections concerning him “into whose custody God entrusted his most precious treasures.” I gladly fulfill this pastoral duty so that all may grow in devotion to the Patron of the Universal Church and in love for the Savior whom he served in such an exemplary manner. 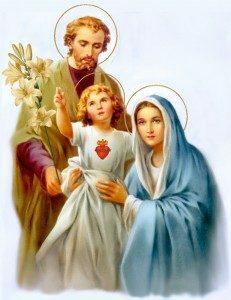 In this way the whole Christian people not only will turn to St. Joseph with greater fervor and invoke his patronage with trust, but also will always keep before their eyes his humble, mature way of serving and of “taking part” in the plan of salvation. I am convinced that by reflection upon the way that Mary’s spouse shared in the divine mystery, the Church – on the road towards the future with all of humanity – will be enabled to discover ever anew her own identity within this redemptive plan, which is founded on the mystery of the Incarnation. This is precisely the mystery in which Joseph of Nazareth “shared” like no other human being except Mary, the Mother of the Incarnate Word. He shared in it with her; he was involved in the same salvific event; he was the guardian of the same love, through the power of which the eternal Father “destined us to be his sons through Jesus Christ” (Eph 1:5).